Allen Curnow (1911–2001) was at the time of his death regarded as one of the greatest of all poets writing in English. For seventy years, from Valley of Decision (1933) to The Bells of Saint Babel's (2001), Curnow's poetry was always on the move – from his early approaches to New Zealand identity and myth to later work concerned with the philosophical encounter between word and world. Curnow also played a major role in New Zealand life as editor, critic, commentator and anthologist, as well as a much-loved writer of light verse under the penname of Whim Wham. In his later years he acquired an impressive international reputation, winning the Commonwealth Prize for Poetry and the Queen's Gold Medal for Poetry. Throughout his lifetime, Allen Curnow revised, selected and collected his poetry in various ways. For the first time, this collection brings together all of the poems that Curnow collected in his lifetime grouped in their original volumes. The notes reproduce Curnow's comments on individual poems and include relevant editorial guidance. 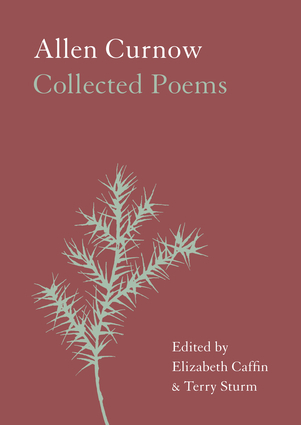 This is the definitive collection of work by New Zealand's most distinguished poet. Elizabeth Caffin was Allen Curnow's publisher and director of Auckland University Press for two decades. Terry Sturm CBE was a professor of literature at the University of Auckland for many years, editor of The Oxford History of New Zealand Literature in English (1990, 1998), author of An Unsettled Spirit: The Life and Frontier Fiction of Edith Lyttleton (AUP, 2003), and editor of a selection of Curnow's verse written under his pseudonym Whim Wham, Whim Wham's New Zealand: The Best of Whim Wham 1937-1988 (Random House, 2005).